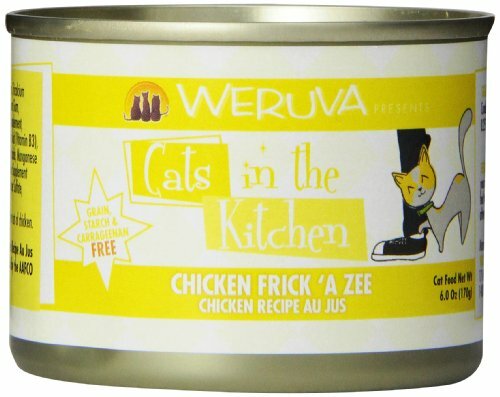 Weruva Cat Food is a brand with wacky names for their ranges of cat food such as Weruva Nine Liver and Weruva Grandma’s Chicken Soup but underlying the fun is a range of high quality, high nutrition foods. They pride themselves on using the best ingredients such as the cuts of meat of flakes of fish to keep the calories count and fat content of their food low while providing all the nutrition a cat needs. Around 10% of all allergies in cats come from something they have eaten and are second only to fleabite allergies and inhalant allergies. They can also account for 57% of the unnatural itching and scratching a cat does. There are ranges of ingredients that cats can be allergic to and if you cat displays, an allergic reaction it can be a trial and error process to find out what the problem is. Some of the more common ones are allergies to beef, lamb, seafood, corn and wheat gluten. Once you have isolated what the problem is, you can adjust their diet accordingly. One example of diet specific food is produced by Weruva in their grain free range. 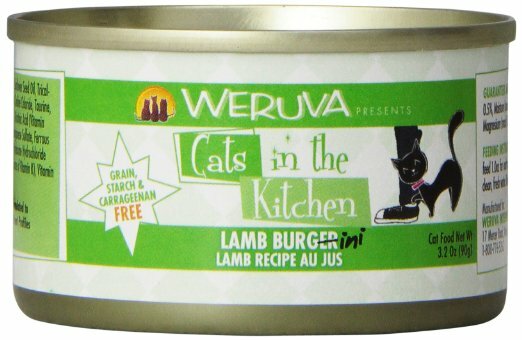 Weruva Variety Pack Grain-Free Canned Cat Food (Pack of 12, 3 ounce cans) is a mixed product containing 12 different flavours of food that are all perfect for cats that have an intolerance to grains. Their foods are also free from added hormones and antibiotics that are sometimes added to food. The range of flavours in one pack means you can alter your pet’s diet often enough to avoid boredom with their meals as well. If your cat has an allergy or an intolerance to something, then you will need to learn to read all that gibberish on the cans of food to ensure you aren’t feeding them something that will upset them. So here is some advice about reading cat food labels. Step one – top three ingredients. The first three items on the list of ingredients are the major contents of the can or pouch and should also contain a named protein source. This can be a meat or fish such as chicken, turkey or tuna not something vague like ‘animal products’. Step two – allergy watch. If you know your cat is allergic to something, scan the list of ingredients for it. While a food may state gluten free or fish free and this will be accurate, something that merely states ‘anti-allergy’ isn’t very specific. To use this Weruva food as an example, the first ingredients are chicken broth and chicken. Other important ingredients are fish oil, sunflower seed oil as well as various vitamins. However if your cat has a fish intolerance, then the fish oil could aggravate it so may need to be avoided. It also contains Taurine, an essential amino acid that a cat needs. Grains vs carbs – just because a food is grain-free, doesn’t mean it is carbohydrate free so look for the sources of carbs in the food. Cats do need some of this in their diet but too much can affect their health and also lead to obesity. Most food contain a small amount of potatoes or veggies but watch they aren’t too high on the list of ingredients. Standards – always make sure the food you buy is labelled as being to the AAFCO standard for cat food. This guarantees it is nutritional and balanced though it has no bearing if your cat has an allergy. The label should also advise that the food has been formulated and tested and shown to meet the nutritional needs of your cat or simply that it is ‘formulated food.’ This gives you peace of mind that it has been fed to cats, not simply checked under lab conditions. Natural – guaranteed natural ingredients means that there have been no chemicals involved in their production. If you cat has allergies or intolerances, it may be worth considering this as chemicals that aren’t natural to a cat can affect these conditions. Age or stage – if your cat is a certain age group such as kitten of over 7 years or if she is lactating then there are ranges of special food that is aimed for him or her. Otherwise, food will generally be designed for any age cat. Specific age or stage foods will have a slightly different make-up to help combat natural imbalances in the body at these points.